Big Brand's string wound cartridge filters provide true depth filtration, high dirt holding capacity, and extremely low media migration. They are a superior, one-piece cartridge manufactured using a high speed, continuous wind process, and are available in a wide variety of lengths and porosities. Especially significant is the availability of filters in an almost endless combination of media and core material, to handle virtually any chemical and/or environment or temperature. All filters are Poly Core. Cartridge Lengths vary from 10", 20", 30" and 40." Microns 1, 5, 20, 50, 75 and 100. If you would like Tin, 304SS or 316SS cores please call in for PRICING!!!! “Electronic Grade” Non-migrating slit film polypropylene free of extractables recommended for use in ultra-pure liquids, electronics, and plating where non-leaching is critical. No extractables or sizing agents present. Chemical resistance equal to standard polypropylene. Low moisture absorption and outstanding abrasion resistance. Lowest static propensity of any man-made fiber. High dry or wet strength. 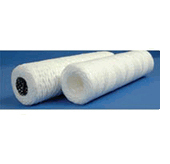 Chemical resistance similar to polypropylene, with high temperature resistance. For use to 350°F. 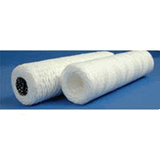 Fluid compatibility similar to bleached cotton, but has more coarse fiber and is less absorbant than cotton. Swells in aqueous solutions. For use to 300°F.